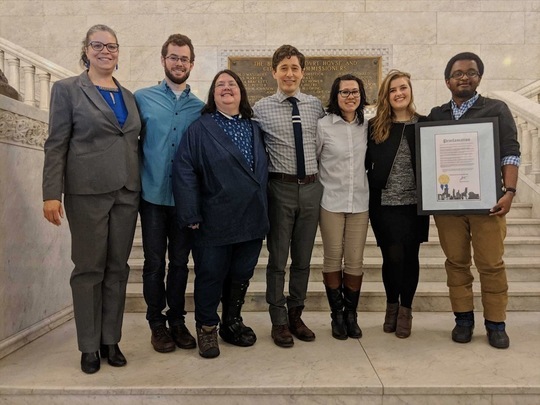 On Tuesday, April 03, current and former City of Minneapolis national service volunteers were honored by Mayor Frey and Corporation for National and Community Service (CNCS) Minnesota Director Sam Schuth at a National Service Recognition Day event at City Hall. CNCS members, such as AmeriCorps and Senior Corps Volunteers In Service To America (VISTAs), help communities across the country address critical needs, including increasing academic achievement, locating affordable housing, mentoring youth, fighting poverty, sustaining national parks, preparing for and recovering from disasters, and more. At the Minneapolis Promise Zone (MPZ) five out of seven employees are AmeriCorps VISTAs, without whom the MPZ would not have the capacity to realize much of it's work around racial and economic equity. Those five MPZ VISTAs attended the event, along with numerous current and former national service volunteers working for and in Minneapolis and surrounding communities. The knowledge and skills gained during the year of service are integral to the impact and success of many government and nonprofit organizations not only during, but after the year of service ends. The first MPZ cohort of nine VISTAs in 2016-17 resulted in four women of color being employed by the City of Minneapolis and partner organizations. Two of those women are employed by programs that received Federal funding: the Department of Health and Human Services (HHS) Resilience in Communities After Stress and Trauma (ReCAST) program at the City of Minneapolis, which serves North Minneapolis; and the Northside Achievement Zone (NAZ) Department of Education (ED) Promise Neighborhood, which is located in North Minneapolis. Those young women of color, and many other volunteers, are now able to repay in-kind the mentorship and training they received by using the knowledge and skills they gained to continue serving their employers and neighbors as they progress in their careers and communities. Minnesota Housing and the Heading Home Minnesota Funders Collaborative, in partnership with the Minnesota Department of Education, the Minnesota Department of Human Services, and the Minnesota Interagency Council on Homelessness, announce the anticipated availability of funds for the Homework Starts with Home program. This initiative will support collaborative efforts between schools, housing organizations, and local governments to identify, engage, and stabilize students experiencing homelessness and their families. Minnesota Housing will allocate up to $3.5 million in Housing Trust Fund resources and up to $450,000 in Family Homelessness Prevention and Assistance Program funds. An additional $250,000 will be made available by the Heading Home Minnesota Funders Collaborative. For more information about this initiative, see the Homework Starts with Home web page. Minnesota Housing anticipates selecting three to eight applicants for funding. Applications are due by 4:30 p.m. on Monday, June 4, 2018. Review the RFP Application Instructions for submission instructions. An information session about the RFP and application process will be held on Friday, April 27, 2018 at 1:00 p.m. at Minnesota Housing. The session will also be available over web and tele-conference. To register for this session and for details about participating remotely, please send an email to hswh.mde@state.mn.us or call 651.582.8511 by Thursday, April 26, 2018. Northside Storyville is back with it's fourth episode! community, to serve the next generation of mothers and families, and to create access to quality midwifery care throughout the northwest metro area. Her practice is small by design in order to maintain personal connections and a sense of individuality with each family served. The City of Minneapolis is seeking development funding proposals for the 2018 Emergency Solutions Grant (ESG) program. ESG program funds may be used to renovate, rehabilitate and convert buildings for use as emergency shelters for people who are homeless. There is approximately $400,000 available and proposals are due no later than 4:00 p.m. on Friday, May 18, 2018. The Tax Cuts and Jobs Act of 2017 established a new economic development program called Opportunity Zones designed to encourage long-term private investments in low-income communities. The Governor of Minnesota has officially sent in his census tract nominations to Department of Treasury. To see which tracts have been nominated follow this link. Thurs, May 3, 2-5 p.m.
Mon, May 7, 9 a.m. -12 p.m.
Mon, May 7, 1-4 p.m. Wed, May 9, 1-4 p.m.
Thurs, May 10, 6-9 p.m.
Mon, April 30, 4:30-6:30 p.m.
Sun, May 6, 1-4 p.m. Wed, May 16, 5:30-8 p.m. Sat, May 19, 9 a.m. -12 p.m.